SAN FRANCISCO, California, December 1, 2010 (ENS) – The U.S. Environmental Protection Agency has fined Chemical Waste Management, Inc. more than $300,000 for failure to properly manage PCBs at its Kettleman Hills Hazardous Waste Landfill. The federal agency began investigating the landfill earlier this year after the central California community of Kettleman City complained of a cluster of facial birth defects, infant deaths and other health issues. Residents suspect the birth defects are linked to the operations of the landfill. The Chemical Waste Management Kettleman Hills Facility handles the treatment, storage and disposal of PCBs, hazardous and non-hazardous waste. It is the only landfill in California federally regulated to handle PCBs, and is one of just 10 PCB regulated landfills in the country. PCBs are liquids that were used in electrical transformers, capacitors, circuit breakers, voltage regulators/switches, plasticizers, and additives in lubricating and cutting oils until they were banned by Congress in 1979. Tests have shown that PCBs cause cancer in animals and are suspected carcinogens in humans. The EPA warns that acute PCB exposure can also adversely affect the nervous, immune, and endocrine systems as well as liver function. “Companies charged with safely disposing of society’s most toxic materials need to rigorously follow the protective laws established to secure both the public safety and public trust. Violations of federal environmental laws at the Kettleman hazardous waste facility are unacceptable,” said Jared Blumenfeld, the EPA’s regional administrator for the Pacific Southwest. 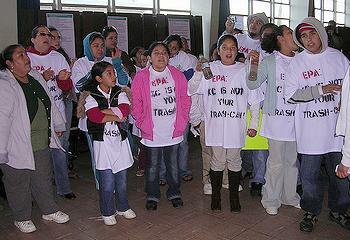 A rural community of about 1,500 mostly Spanish-speaking residents located off Interstate 5 about halfway between San Francisco and Los Angeles, Kettleman City is facing the possible expansion of the landfill to take waste from large population centers, including Los Angeles. Residents are suing the Kings County Board of Supervisors challenging its approval of the expansion. “These families are looking for answers, and collectively as public agencies it is our responsibility to help come up with those answers,” said Blumenfeld earlier this year. During a series of 2010 inspections, EPA investigators found that Chemical Waste Management improperly managed PCBs at the facility. Further analysis revealed spills next to the facility’s PCB Storage and Flushing Building. Samples taken by EPA and Chemical Waste Management in and around the building detected PCBs at elevated levels ranging from 2.1 parts per million (ppm) up to 440 ppm. These levels are above the regulatory limit of 1 ppm and, in soil, demonstrate that PCBs were improperly disposed of in violation of federal law. The current fines relate to the mismanagement of PCBs within the confines of Chemical Waste Management’s property. “There is no evidence to suggest that the current spills posed any danger to adjacent communities,” the EPA said in a statement Tuesday. The question of whether there is any human health or environmental risk of PCBs migrating off site is being evaluated by a PCB congener study that is nearing completion. A PCB congener is any single, unique well-defined chemical compound in the PCB category. In addition to the PCB releases, Chemical Waste Management failed to fully comply with information and decontamination requirements, the EPA said. A PCB container label and some materials containing PCBs did not display essential data required by federal law. EPA investigations also found that Chemical Waste Management failed to decontaminate PCB handling areas prior to continued use. Chemical Waste Management has cleaned up PCB releases at the facility under a cleanup plan approved by EPA and the State of California, Department of Toxic Substances Control submitted to the agencies and approved in September and October 2010. The company must submit a final report documenting its cleanup to both agencies.